Regular circumstances of work usually require certain actions to be performed on a vessel entering a port (loading/unloading cargo, tugging, etc.). Accordingly, calling a port by vessel may require a number of auxiliary services to be rendered as well as certain formalities fulfilled and payments made. Some of the operations require preliminary preparation before vessel’s arrival while others, reversely, will not be completed until her departure. The captain would find it supremely problematic, especially in least-known ports, to have to fulfill all the procedures during port call without help from the outside expert. In order to optimize carrying out such tasks ship-owners hire ship agents during vessel’s port call. Ship Agent is a sh ip-owner’s trustee acting on the ship-owner’s instructions, on the ship-owner’s behalf and in the ship-owner’s interest. Such standing determines relation and interaction between the master of the vessel and the agent. As the master of the vessel is recognized as a representative of the ship-owner and the agent merely as his trustee, should any disputes arise between them, the master’s decision shall have the upper hand. The master, though, should give due consideration to the agent’s opinion since the latter will be better acquainted with the local regulations and those of the port, he will be well-experienced at settling commercial problems, etc. It is through the mediation of the ship agent that the ship-owne r will officially contact the cargo-owner, stevedoring companies and port authorities and bodies playing a part in servicing vessels in the port. It is an obligation of the ship agent to fulfill the ship-owner’s commands and instructions. For his service, the agent is remunerated by the ship-owner at the rates quoted by Ukraine’s Ministry of Transport. informing the ship-owner and mast er of the vessel about port’s regulations, rules, etc. carrying out individual orders of the master and the ship-owner. Ship agent firms will not usually fulfill all the above actions themselves. But as those obligations are the agents’ responsibility, they will conclude agreements with stevedoring, tugging, bunker and other companies. The quality of the service rendered by the agent depends to a certain degree on the correct action of the ship master. Primarily, this concerns fulfilling a number of conditions facilitating the agent’s work. the need to procure with fuel, provisions, materials , etc. for the ship. Failure to duly advise the agent of the ship’s arrival and file requests for needed supplies may lead to claims from various bodies of the port and extend the time necessary to fulfill those requests by the agent. In performing their activities, the agent will be governed by Ukraine’s Merchant Shipping Code. Disbursement account. On the ship-owner’s instruction the agent in charge of vessel will have to pay, at the expense of the ship, all established duties and dues of the port as well as cover bills for work and services done on the master’s demand. On the basis of the bills for the services, the agent draws a consolidated bill, which is known as disbursement account. The agent will submit this account to the ship-owner. The disbursement account should be drawn up properly and accompanied by documented proof for each item of expense. Kerch Strait passage dues and charges. Agency fee, transport fare, post expenses, etc. Costs due to requests of captain. Most privileges, advantages and discounts are stringently regulated by the Decree of the Cabinet of Ministers of Ukraine #1544, 12 of October, 2000 (subsequently enlarged and amended) and the Ministry of Transport Order #214, 27 of June, 1996. Quoting rates, tariffs and discounts other than those established is forbidden. Port charges are calculat ed on basis of conventional volume of vessel (in m3) as a result of multiplication of three values (L.B.P., Moulded depth and Width) as per International Tonnage Certificate (ITC) of vessel or a document replacing it. A number of factors are also taken into account in this calculation: draft of laden vessel, her technical characteristics and capacities, type of cargo, time of arrival and departure from the port, etc. Vessels under U krainian flag pass Kerch Strait on their own. All charges are paid directly by ship-owner to the administration of the port of Kerch. For vessels under a foreign flag these charges are OBLIGATORILY and are solely payable via ship’s agent. Depending on construction type of c ertain vessel a number of discounts in the tariffs could be applied. 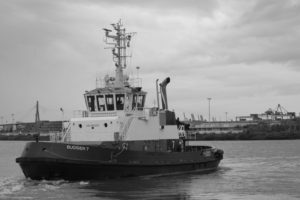 For instance, vessels equipped with bow thruster are granted with 25% rebate on Tug Dues. Agency Fee depe nds on type of cargo. Agency fee may vary (from min to max): liquid cargoes (tankers), bulk cargoes, dry (general) cargoes, dangerous (IMO) cargoes. Previo us port or destination. For vessels consecutively calling several Ukrainian ports within the same voyage rebate on some port charges will be applied. Winter time during ice c onditions extra charges for icebreaker assistance may be charged. Time of entry into port. Whenever a vessel is enteri ng a port during weekend or night time, higher tariffs (overtime surcharge) will be applied on some port charges. Berdyansk, to wn in Zaporozhskaya Oblast of Ukraine, on the Sea of Azov. Its history dates back to early 19-th century when the settlement of Berdy (stands for rich in Turkic) was established together with a quay for commercial vessels founded in 1827. At present, Berdyansk is a local centre with well-developed machine building, metal working and textile and food manufacturing enterprises. Since late 19-th century, Berdyansk has also been renowned as a mud cure and climatic resort. The town has a population of 134 thousand. The commercial port of Berdyansk is the only sea junction of Zaporozhskaya Oblast. Today, the port of Berdyansk mainly serves exports. It is scrap metal and metal ware (sheet metal, billet, etc) that account for the major part of goods flow. The trans-shipment of clay for porcelain manufacturing as well as that of coal and cereals occupies a considerable share. Navigation in the port continues all year round. Winds of north-eastern direction are prevalent. The share of days with the intensity of wind exceeding 15 m/sec is 24%. The average annual temperature is +10.7°C. On average, 30-35 days a year are foggy. The port is situated in the north-eastern part of the bay of Berdyansk and comprises the outward roadstead, the passage canal and Berdyansk harbour. Berdyansk harbour, where major wharfage (piers #1-6) is found, is protected by a breakwater, whereas piers #7-9 are not breakwater covered. The harbour consists of the Western basin and the Eastern basin. The latter is protected by a mole from the west and by the breakwater from the south-west.